A Boundless World of Senses Filled with Astounding Videos, Images, and Sounds: the world’s leading cross-terminal “multi-screen viewing” television service. Multi-Screen View: watch the same programs on different devices. Multi-Screen Shift: automatic continuation, after watching a program on one device, the program will automatically continue to play from where you left off on a different device. Multi-Screen Recommendations: Create “My Channels” on the iPad and PC to view your selected channels on your television. Multi-Screen Favorites: one folder for various devices that collects your favorite channels and programs. The realistic texture of the images and the smoothness of the video flow create a stunning effect of a pleasant visual feast. 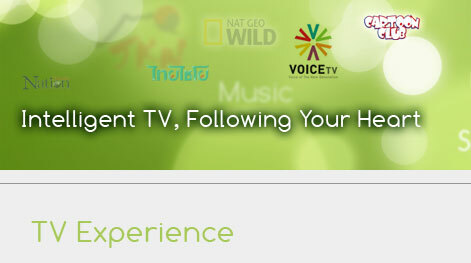 Intelligent TV, Following Your Heart—Internet experience similar to operating a smart TV. Combines traditional television with Internet video viewing habits to create a peak personalized experience. We have realized many developments through the wisdom of human-computer interaction technology such as the catch-up function, time-shift function, games, and video telephone (in development) and many other powerful applications.